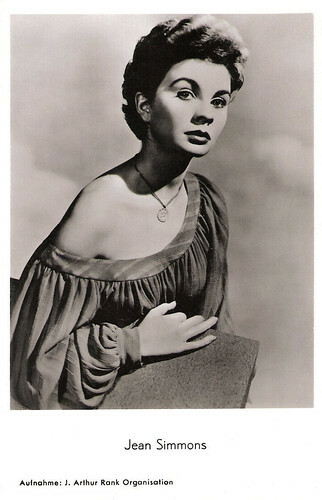 Demure, dark-haired English beauty Jean Simmons (1929 - 2010) was in the late 1940’s a box office attraction in films like Great Expectations (1946) and Hamlet (1948). In 1950 she moved to the US with her husband, Stewart Granger, and soon became a major Hollywood star who would be twice nominated for an Oscar. German postcard by Krüger / Ufa, no. 902/144. Photo: Terb Agency / Ufa. German postcard by F.J. Rüdel Filmpostkartenverlag, Hamburg-Bergedorf, no. 115. Photo: J. Arthur Rank Organisation. German postcard by ISV, no. A 26. Photo: 20th Century Fox. 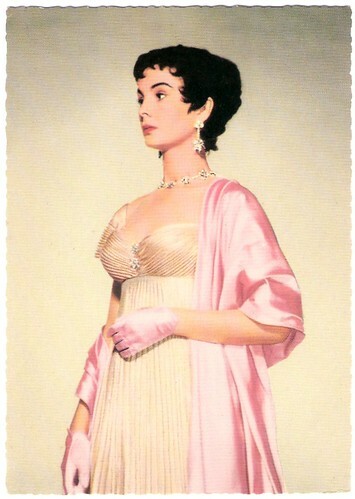 Jean Merilyn Simmons was born in London, England in 1929. Her father, a schoolteacher, helped Jean to start in a dancing school. Two weeks later the school was visited by producer Val Guest, who was looking for a ‘fresh face’ to play Margaret Lockwood's precocious sister in Give Us the Moon (1944, Val Guest). He had found her. Jean went on to make a name for herself in such major British productions as the G.B. 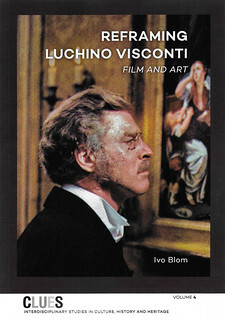 Shaw adaptation Caesar and Cleopatra (1945, Gabriel Pascal), as the pretty, seductive and mischievous Estella in Great Expectations (1946, David Lean), as a sultry native beauty with a nosering in Black Narcissus (1947, Michael Powell, Emeric Pressburger), the original version of The Blue Lagoon (1949, Frank Launder), and the thriller So Long at the Fair (1950, Antony Darnborough, Terence Fisher) costarring Dirk Bogarde. 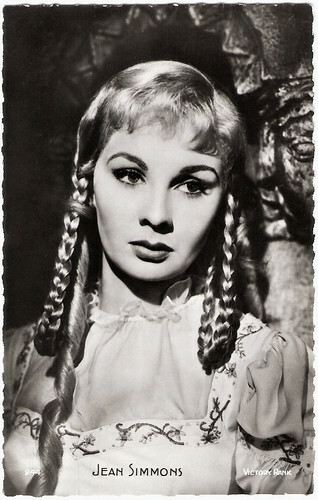 For her role as Ophelia in Olivier’s adaptation of William Shakespeare's Hamlet (1948, Laurence Olivier), she earned a Best Supporting Actress Oscar nomination. 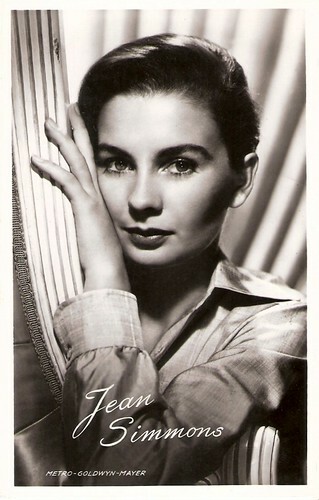 Jean Simmons was revered and beloved by both the British critics and filmgoers. 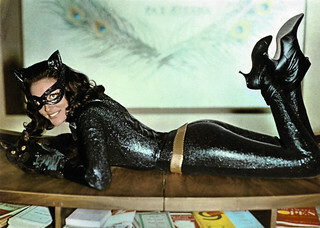 By the end of 1950, she was the #4 box office attraction, American or British, in British cinema. Only 20 and seemingly on top of the world, Jean soon had her own flat in London and the luxuries that stardom brings. Dutch postcard by Uitg. Takken, Utrecht. Photo: J. Arthur Rank Organ. 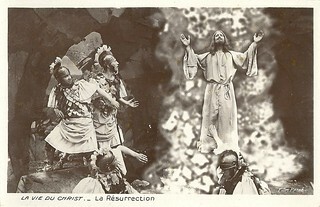 French postcard by Editions P.I., Paris, no. 244. Photo: Victory Rank. In 1950, Jean Simmons married actor Stewart Granger, 16 years her senior. They had met when she played his adopted daughter in the romantic comedy Adam and Evelyne (1949, Harold French). Together they made the transition to Hollywood. Granger was under contract to Metro-Goldwyn-Mayer and would play Allan Quartermain, the Prisoner of Zenda and Scaramouche. The 21-years old Simmons found out that RKO head Howard Hughes had purchased the remaining six months of her Rank Studio contract. When Hughes claimed that an oral agreement with Rank precluded her from being loaned out to any other studio, she sued RKO. The legal battle raged for over a year. When the suit was finally settled, RKO had a three-year contract for Jean's services but was obligated to pay her $250,000 in addition to her legal fees. Furthermore, she won the right to work on loan to other studios at a substantial salary. David Thomson writes in his 2010-obituary in the Guardian: "The strange tycoon was obsessed with her personally, and he laid siege to her romantically and professionally so that she did not work for over a year. Only one thing emerged from the stand-off, Angel Face, in which she is a spoiled child and lethal temptress who seduces nearly everyone she meets (most notably Robert Mitchum). The brilliant picture was directed by Otto Preminger and photographed by the great veteran Harry Stradling. Thus it contains – and she sustains – some of the most luminous close-ups ever given to a femme fatale. How far she understood the picture is unclear. One can only say that it is a rare tribute to unrequited love." Dutch postcard by Uitg. Takken, Utrecht. Photo: Metro-Goldwyn-Mayer. 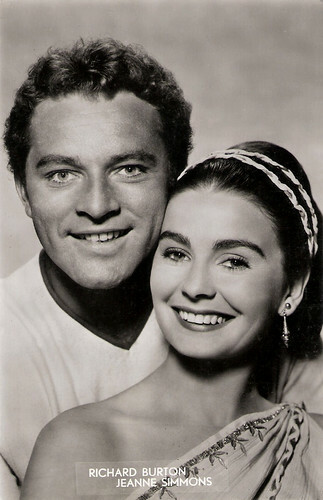 Among Jean Simmons' best-known Hollywood films are the biblical epic The Robe (1953, Henry Koster) with Richard Burton, The Egyptian (1954, Michael Curtiz) with Victor Mature, and The Big Country (1958, William Wyler) with Gregory Peck. She also starred in the Frank Sinatra / Marlon Brando musical Guys and Dolls (1955, Joseph L. Mankiewicz). She used her own singing voice and earned her first Golden Globe Award. 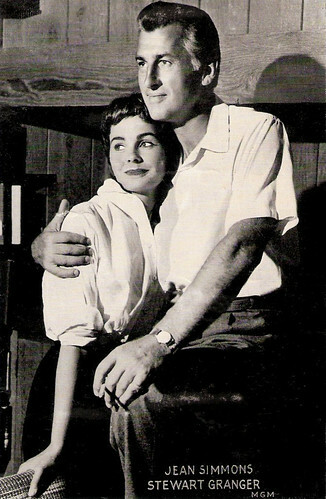 Simmons divorced Granger in 1960 and almost immediately after married writer-director Richard Brooks, who cast her as Sister Sharon opposite Burt Lancaster in Elmer Gantry (1960), a memorable adaptation of the Sinclair Lewis novel. That same year she costarred with Kirk Douglas in Stanley Kubrick's Spartacus (1960) and played a would-be homewrecker opposite Cary Grant in The Grass Is Greener (1960, Stanley Donen). French postcard. There may have been a fling with Burton, suggests David Thomson in his obituary in The Guardian. Off the screen for a few years, Jean Simmons captivated moviegoers with a brilliant performance as the mother in All the Way Home (1963, Alex Segal), a literate, tasteful adaptation of James Agee's A Death in the Family. After that, however, she found quality projects somewhat harder to come by, and took work in Life at the Top (1965, Ted Kotcheff), Divorce American Style (1967, Bud Yorkin), and The Happy Ending (1969, Richard Brooks) for which she was again Oscar-nominated, this time as Best Actress. By the 1970's, she turned her focus to stage and television acting. In the theatre she appeared most notably as Desiree in the London premiere of Stephen Sondheim's A Little Night Music (1974) and she headlined the American national tour as well. She and Richard Brooks divorced in 1977. In the 1980’s she mainly appeared in TV mini-series, such as The Thorn Birds (1983, Daryl Duke) for which she won an Emmy Award, and North and South (1985, Richard T. Heffron). Becoming depressed at the lack of quality parts being offered her, Jean became addicted to alcohol. In 1986, she sought professional treatment. Jean made a comeback in the cinemas in How to Make an American Quilt (1995, Jocelyn Moorehouse), co-starring with Winona Ryder and Anne Bancroft. More recently she gave her voice to the elderly Sophie in the English version of the beautiful animation film Hauru no ugoku shiro/Howl’s Moving Castle (2004 Hayao Miyazaki). Her last film was Shadows in the Sun (2009, David Rocksavage) with James Wilby in which she was deeply touching as a dying poet. In 2003 she was made an OBE (Officer of the Order of the British Empire) for services to acting. 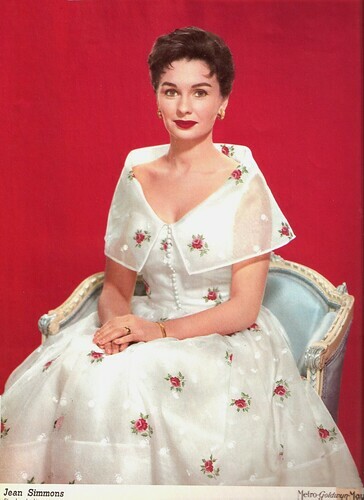 Jean Simmons lived as a naturalized U.S. citizen in California, where she had been for the last fifty years. 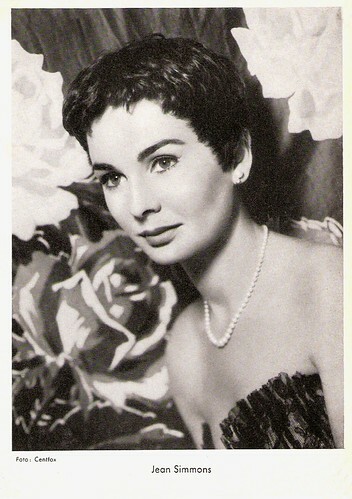 Jean Simmons passed away in 2010, at the age of 80. She had two children: a daughter with Stewart Granger, Tracy Granger, and a daughter with Richard Brooks, Kate Brooks. Sources: David Thomson (The Guardian), kdhaisch (IMDb), Wikipedia, and IMDb. She was such a lovely woman. I enjoyed her acting very much. This is a fitting tributed to a woman who not only looked beautiful, but was just as gorgeous on the inside. EFSP is on Blogger. We used one of their standard blog designs, but changed it to our taste. Glad you like it.